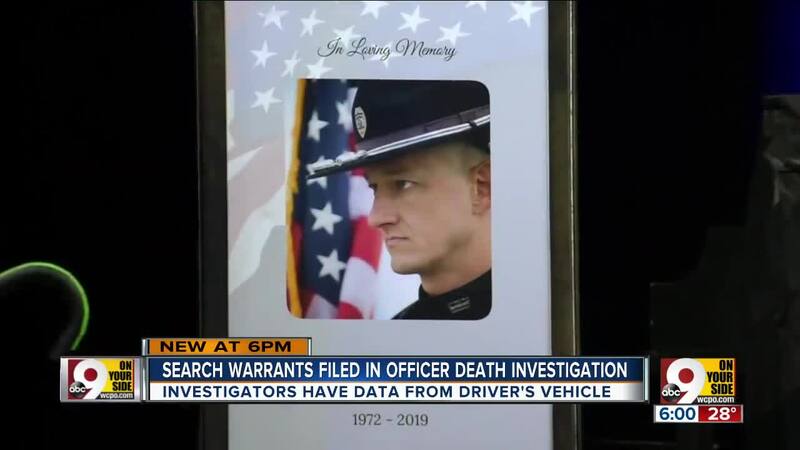 Court records obtained by the 9 On Your Side I-Team reveal new details about the criminal investigation into the death of Colerain Township police Officer Dale Woods. A pickup struck Woods Jan. 4 as he helped other officers manage traffic near a prior Colerain Avenue crash. He spent three days at the University of Cincinnati Medical Center before dying of his injuries Jan. 7. The Cincinnati Police Department continues to investigate the fatal collision. In an affidavit filed as part of a request for three separate search warrants in the case, Cincinnati police Officer Mike Flamm identifies the male driver of the pickup by name. WCPO is not naming the driver because he has not been criminally charged in the case. Investigators obtained medical records documenting the treatment the driver received at University Hospital, where he was examined after the crash, according to court documents. The records do not indicate whether investigators received any blood or urine samples from the hospital. Investigators also obtained data from the crash data recorder on the driver’s pickup. Said data may help investigators determine the speed of the vehicle at the time of the crash and whether it made any sudden movement. Cincinnati police Lt. Steve Saunders told the I-Team Thursday afternoon that an accident reconstruction team visited the scene of the crash earlier in the week. Saunders declined to provide more information because the investigation remains active and no charges have been filed. WCPO left a message for the attorney representing the driver of the pickup. He had not responded by Thursday afternoon. A reporter also attempted to reach the driver but was unable to contact him.